We can supply and install cruise control to almost every vehicle including the very latest drive by wire and can bus systems. Our workshop is equipped with computerized programing equipment to ensure the correct compatibility with your vehicle. We only recommend and install quality Command Auto cruise control systems. Our technicians have over 20years experience in the supply and installation of cruise control systems. Command Cruise Control and Speed Limiter Professional Series technology under your dash and bonnet provides the best possible engineering. After all - what price can be put on the safety of your family? 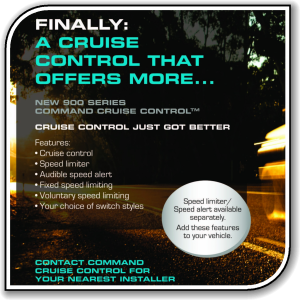 Command Cruise Control and Speed Limiters can be fitted to most Australian and imported vehicles (including four wheel drives and light commercials). From Drive by Wire, Electric and Vacuum models, Command Cruise Control and Speed Limiters has all professional options covered. Command Cruise Control constantly monitors vehicle speed. This enables the driver to concentrate on road conditions and drive in a more relaxed manner. All electronic operations are carried out instantly via software created by engineers who design product for some of the largest OEM clients World wide. With the increasing presence of speed cameras. both fixed and moving, there is little chance that drivers will not be apprehended for speeding. Command Cruise Control and Speed Limiters offer a more relaxed driving experience.